In its size, variety and quality, the MMFA’s international art collection is unique in Quebec and one of the three largest in Canada. Its presentation in the Michal and Renata Hornstein Pavilion for Peace, inaugurated in 2016, enables the Museum to display the strength and depth of one of Canada’s outstanding collections, which covers important milestones of civilization. The works of the Hornstein gift have been incorporated into the existing collection both chronologically and thematically. Thus, 750 works of international art are displayed on four levels of the building, while Ben Weider’s Napoleonic collection is also integrated into the layout of the pavilion in a fluid and logical manner. With its 1,430 paintings, sculptures, miniature portraits, drawings and prints, the collection boasts masterpieces by Boucher, Bouguereau, Pieter Bruegel the Younger, Canaletto, Emmanuel de Witte, El Greco, Fantin-Latour, Gainsborough, Goya, de Largillierre, Mantegna, Poussin, Rembrandt, Gerard ter Borch, Tiepolo, Tissot and Veronese. These major artists represent the principal styles and periods of the history of art between the Middle Ages and the mid-nineteenthth century. One of the strengths of the collection lies in the 138 Dutch and Flemish seventeenth-century paintings, which make the MMFA an important repository of works from the rich artistic context of the Dutch Golden Age. In addition to encompassing the history of art, the collection reflects the great generosity of eminent patrons of the Museum, particularly of Michal and Renata Hornstein. The Church was the principal patron of art, the main function of which was to give thanks to God. This section comprises various religious and decorative objects (chalices, candlesticks, patens, caskets, paintings, plaques, fragments of architecture and stained glass), mostly anonymous and executed from the thirteenth to the sixteenth centuries in France, Spain, England, Italy and Russia. Italian Gothic art, represented in this section by two paintings on panel on the subject of the Virgin and Child executed by Giovanni del Biondo and Andrea di Bartolo, reflect a respect for and deep understanding of classical sculpture. This period, which coincided with the rise of universities, international trade and consequently of the middle class, also saw the emergence of secular art and of the earliest modern portraits. The Portrait of a Man (about 1480) by Hans Memling, displayed in this section, is a fine example. The origins of the style commonly called Renaissance go back to the early-fifteenth century in Florence, Italy. It is characterized by the strong influence of classical antiquity enriched by naturalism and the individualistic feeling inherited from the late-Gothic period. In this section visitors can admire masterpieces such as The Virgin and Child with Saint Michael and Saint Blaise (about 1475) by Neri di Bicci; Portrait of a Man of the House of Leiva (about 1580-1585) by El Greco; Christ Crowned with Thorns (about 1584-1585) by Veronese; and Portrait of a Member of the Foscari Family (about 1555-1560) by Tintoretto. The popularity enjoyed by small bronzes and medallions among Italian collectors during the Renaissance testifies to artists renewed interest in the antique world. Italian artists Galeazzo Mondella, called Moderno; The Adoration of the Magi, 1490) and Valerio Belli; Jesus among the Doctors of the Law (about 1532) as well as Pietro Tacca; Satyr (undated) and Alessandro Vittoria; Mercury (undated) are excellent examples. Later on in the sixteenth century, artists still looked back to works of the past − from antiquity to the recent creations of Michelangelo and Raphael – but, unlike their predecessors of the Renaissance, they paid less attention to the natural world or to the expression of emotions. This section comprises five painted works, including two oils on panel by the Belgian artist Hendrick de Clerck depicting the same subject, Moses Striking the Rock (about 1610). The style of Michelangelo Merisi da Caravaggio, known as Caravaggio (1571-1610), the Italian artist whose work revolutionized painting in terms of both form and iconography during the first half of the seventeenth century, influenced the whole of Europe. Dutch caravaggists who moved to Rome, like Gerrit van Honthorst; The Duet (1623-1624), Godfried Schalcken; Salome with the Head of John the Baptist (about 1700) and Matthias Stom; Christ and the Woman Taken in Adultery (about 1630-1633), Valentin de Boulogne, called Valentin in France, and the Italians Mattia Pretti; Tobit Blessing Tobias (about 1660) and Bernardo Strozzi; Eratosthenes Teaching in Alexandria (about 1635) are eloquent examples of his influence. The Baroque movement embraced Classicism as well as the theatrical realism of Caravaggio and his emulators, along with the naturalism of Flemish painters like Pieter Boel with the oil on canvas Still Life with Game and Hounds (about 1600) and the Dutch artists represented here with oils on canvas, especially Jan Both; Southern Landscape with Travellers (about 1645-1650), Jan Baptist Weenix; River Landscape with a Ferry (about 1650), Jacob von Ruisdael; The Bleaching Grounds at Haarlem (about 1670) and Abraham Bloemaert; Harvest Scene (about 1625-1630). The “Golden Age” saw a proliferation of pictorial genres and specialization by artists. Still lifes such as Young Girl with Still Life (about 1620) by Floris van Schooten and Still Life with Candlestick (between 1660 and 1685) by Pieter van Roestraten; scenes of everyday life by Emanuel de Witte; Interior with a Woman Playing a Virginal (about 1660-1667) and Jacob Duck; Interior of an Inn with a Cavalier and a Sleeping Woman (about 1645); portraits by Gerard Ter Borch; Portrait of a Woman (about 1676-1677) and Rembrandt; Portrait of a Young Woman (about 1688) and by his pupil Nicolaes Maes; The Adoration of the Shepherds (1658) are excellent examples of the period. Louis XIII came to the throne of France in 1617. Unlike Baroque art, which persisted, Classicism advocated a clear and orderly vision. The classical world was the model for grandeur and the city of Rome the obligatory destination for many French artists. Examples of their work include canvases by Laurent de la Hyre; Landscape with a Swineherd (1648), Jean Lemaire; Roman Senators and Legates (1645-1655), Philippe de Champaigne; The Tribute Money (1663-1665), Claude Lorrain; The Daughters of Helios Searching for Their Brother Phaeton (1658), Sébastien Bourdon; Landscape with Classical Ruins (about 1635), as are Nicolas Poussin’s idealized landscapes with lyrical atmospheric effects; such as Landscape with a Man Pursued by a Serpent (1637-1639). In the eighteenth century, the late Baroque style was generally called the Rococo, a term composed of a blend of the Italian barocco and the French rocaille, a kind of decor popular at the time that used shells and pebbles. This style is very apparent in the passionate gestures and tender expressions of François Boucher’s Assumption of the Virgin (about 1758-1760), the lyrical colourism and delight in depicting patterns and surfaces in the Portrait of a Woman as Astrea (about 1710-1712) by Nicolas de Largillierre and the lightness of touch tinged with eroticism of Apelles Painting the Portrait of Campaspe (about 1726) by Giovanni Battista Tiepolo. In the second half of the eighteenth century, the archaeological excavations in ancient Herculaneum and Pompeii sparked a mania for the antique across Europe. This section illustrates the Neoclassical style with works by French artists such as the Portrait of Madame Mercier (about 1780) by Jean-Baptiste Greuze; Young Girls Dancing around an Obelisk (1798) by Hubert Robert, Forest Interior (1826) by Jean-Victor Bertin and Portrait of a Man in a Red Cape (1795-1800) by François-Xavier Fabre. The portrait was one of the most popular genres of painting during the rococo period and was particularly fashionable in Great Britain in the eighteenth century. In the 1700, almost all of the leading British artists, many of whom are represented in this gallery, were famous for their large-scale portraits. Notable are the paintings of Joshua Reynolds; Portrait of a Young Woman in a Turban (about 1760-1765), John Opie; Portrait of John Elliott (about 1785-1790), Henry Raeburn; Portrait of Mr. D. (about 1790), Thomas Gainsborough; Portrait of Mrs. George Drummond (1779-1782) and John Romney; Portrait of Mrs. Anthony Wright (1781). 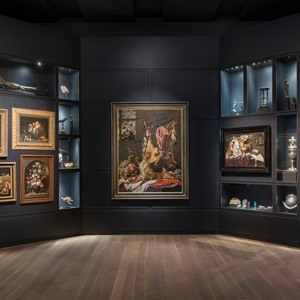 The Empire Gallery displays about a hundred works linked to Napoleon and his epoch – jewellery, furniture, fine arts and personal items – brought together thanks to the gift of the collection of the Montreal patron of the arts Ben Weider. A travelling writing case (1805) and one of the cocked hats worn by the Emperor – this one from the Russian campaign (1812) – are among the objects in this collection, one of the most important in North America. 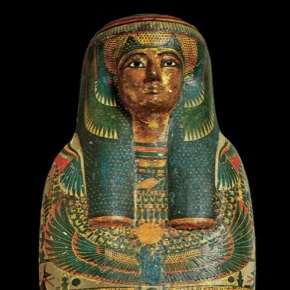 Many of these items are coveted by museums across the globe. Born in England and Germany in the late-eighteenth century, the mal du siècle or the malady of the century, according to Alfred de Musset, spread across Europe following the costly exploits of Napoleon. The Romantic movement produced picturesque works rich in historical details, such as those by Alexandre Évariste Fragonard, Francis I in Benvenuto’s Studio (1820-1830) and Henri Baron, Leys Charity (1850). A lyrical approach to nature is found in the landscapes and seascapes of Georges Michel, Landscape (with Sea) (about 1820-1830) and Eugène Isabey, Brittany Coast Scene (1860). The Romantic quest for the sublime and the irrational is illustrated in the paintings of Théodore Chassériau, Young Woman Weeping at a Stela (1840), Paul Delaroche, Ludmila Komar, Princess of Beauvau-Craon (1849) and the sculptures of Jean-Jacques Feuchère, Leda and the Swan (about 1850) and Pierre-Eugène Émile Hébert, Forever!! Never!! (1860). Orientalism developed as an art movement following Napoleon’s campaign in Egypt in 1798 and above all throughout the nineteenth century the era of European conquest and colonization of North Africa and the Middle East. The first generation of Romantic artists, represented in this section by works by Alexandre-Gabriel Decamps and Eugène Fromentin, dreamed of finding in the Orient an ancient world illuminated by the vivid colours of the exotic, while the second generation, paying closer attention to ethnological accuracy, sometimes fell into the trap of a facile “bazaar Orientalism”: see Jean-Joseph Benjamin Constant, Evening on the Terrace (Morocco) (1879) and Alberto Pasini, Entrance to the Bazaar, Cairo (1880-1890). The “painters of reality” depicted contemporary subjects from their own viewpoint, neither copying others nor following convention. The works shown here by Gustave Courbet, Aimé-Jules Dalou and Honoré Daumier show the new attention paid by artists to working people, with an underlying political republican intent. Their style was characterized by the extensive use of black, very apparent in the paintings of French artists like François Bonvin, Still Life (about 1870), Gustave Courbet, The Brook of the Black Well (about 1855), Henri Fantin-Latour, Peonies (1876) and Théodule Ribot, The Morning Wash (The Children’s Home) (about 1863). On the outskirts of the forest of Fontainebleau, not far from Paris, a group of artists painted out of doors, a practice made possible by new inventions, in particular tubes of paint. Inspired by seventeenth-century Dutch landscapists, they founded a “modern school of landscape” that opened the way for Impressionism. They portrayed a simple, often nostalgic view of rural life, far from the vices of the new urban and industrial society: Camille Corot, L’île heureuse (about 1865-1868), Charles François Daubigny, Moonrise at Auvers (1877), Henri-Joseph Harpignies, Côte d’Azur Landscape (1865) and Charles-Émile Jacque, Landscape with Sheep (after 1848). 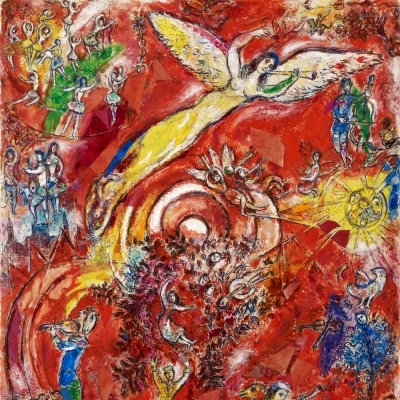 The strength of the collection lies in a number of works produced in Paris, the cradle of modern art, and several associated with German Expressionism. The artists represented, who include Cézanne, Courbet, Dali, Daumier, Derain, Giacometti, Kandinsky, Matisse, Miró, Monet, Picasso, Rodin and Sisley, were among the most influential and original figures of the modern era.